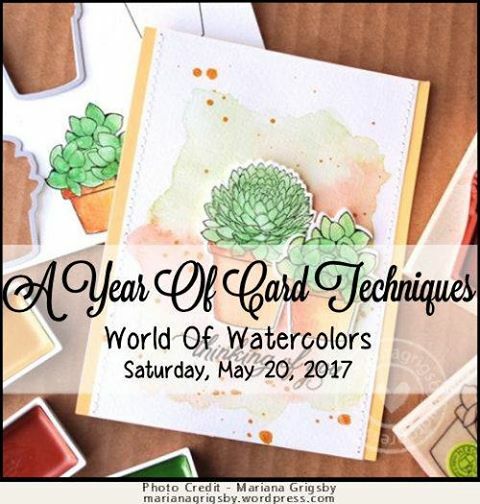 Crafting with a View: A Year of Card Techniques ~ May Blog Hop ~ World of Watercolors! 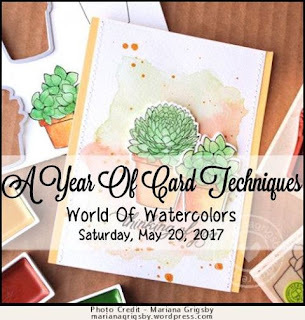 A Year of Card Techniques ~ May Blog Hop ~ World of Watercolors! And speaking of winners, the lucky hopper from last month is Golden Goddess Designs; picked by Random Name Picker. Congratulations! Please get in touch with last month’s sponsor, Wilma Payne at wpayne@email.com, to claim your prize. You should have arrived here from my wonderful friend Sharon. If you're visiting here first, you might want to start at the beginning so you don't miss a thing and increase your chances of winning by commenting on each blog. 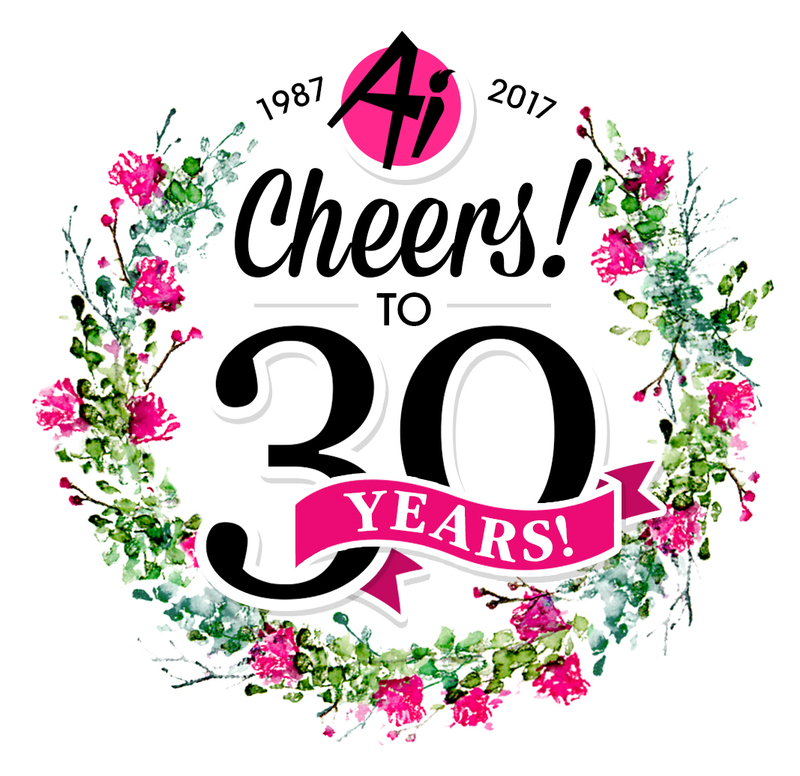 For this months hop I thought I start with a simple palette of watercolors, like the case we offer at Close to My Heard...click here! It is important to use a good watercolor paper. I like to use the Canson XL Watercolor Paper 140 lb. 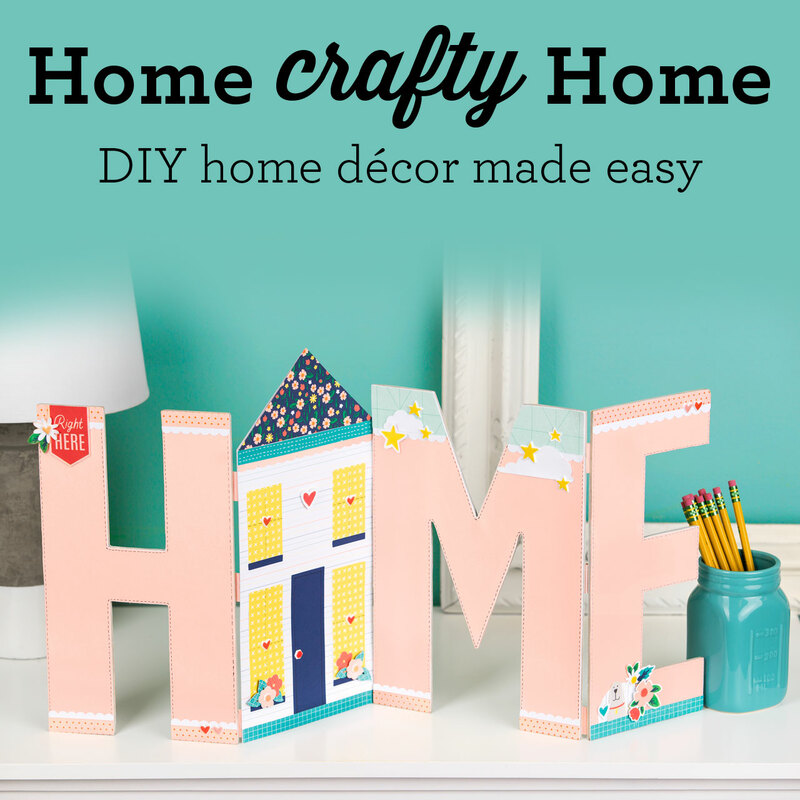 It is relatively inexpensive and you can find it at most craft stores. The paper has a nice weight and thickness...because if you paper is too thin it will wrinkle really bad. I started with a bunch of watercolor paper pieces measuring 5" x 4" or a little bigger. Card 1: For the first card I simply draw a rectangular with clean water on my paper. This helps to saturate it and keeps the color somewhat confined. I used three different blues. A wide brush and a few strokes across the paper in each color and this one is ready to dry. Card 2: The second card is even easier to make. I used lots of water and some yellow, orange and a little pink watercolor paint and added it on my paper. I did added clear water over the whole piece before I started adding colors. You can do this in strips, dots and fill in the blanks. Just try it :-) Once dry, I cut them in squares and created my own little quilt. This tile technique is perfect if you have some of your pieces were you only like part of it. Card 3: Here is an example of watercolor background were I added water onto my paper first. Next I dabbed watercolor paint on it and let the color run. While wet, the color looks more intense then when it is dry. 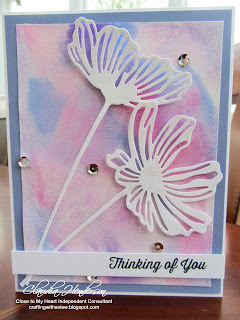 Cut to size for your card, mat it and place some die-cut flowers on it and one more card is done. 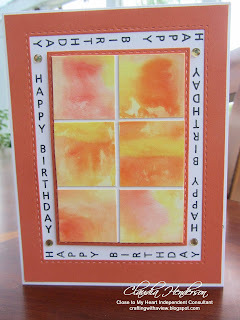 Card 4: For the next example I used a wide brush lots of water and different hues of yellow and red. I brush each color in one stripe. Some colors flow more than others, but I tried to start and end in one line. Be careful when you stamp a phrase on your watercolor paper. First off, make sure your paper is absolutely dry. 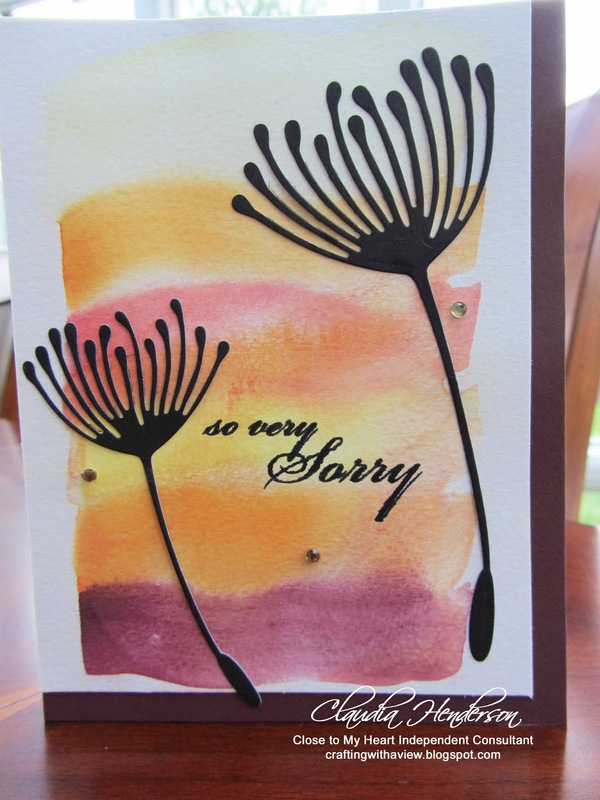 Second, use an ink that dries really quick, since the paper will absorb the ink and therefore your stamped image will be a bit fuzzy, as you can see here with my "so very sorry". I hope these little examples will help you get a start on your watercolors. Just try and have some fun. I created more samples than I have shown here, but I will try to get them done for my follow ups. I will have more detailed descriptions on how to make these cards and more pictures in my follow up posts in the next two upcoming Fridays. Make sure to check back often and please let me know when you have questions. There are so many more techniques with watercolors but this would be too much to show them all here... but if you are living close by, contact me for a water coloring class or let me know if you would like to see more posts of the different water coloring techniques. Now you’re off to visit with my talented friend Kim. Hope you had fun and thanks for stopping by. See you next month with another technique! "Art comes from the heart. there is only YOUR WAY." Absolutely awesome! That second one so caught my eye. What a great technique, and the colors are fabulous. Those little panels are really pleasing to the eye. And the third one . . . that background and die overlaying it . . . perfection. Beautiful work. Great hopping with you. 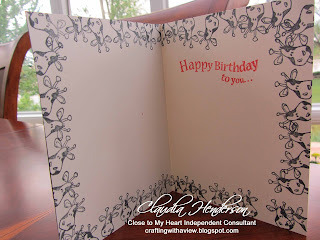 Claudia, as always your cards are lovely and a great inspiration. I'm one of those who has a difficult time with watercolor. I like things very precise, so the unpredictability of watercolor unnerves me. I so enjoy hopping with you and look forward to seeing what you create each month. Claudia, all of your cards are beautiful as always. You've given me a lot of inspiration and the desire to try my hand at watercoloring again. Maybe I will actually come to love it, lol. Thanks for hopping along, my friend! absolutely wonderful cards, I can't decide which one I like best! These make beautiful backgrounds. Great color combinations. Great cards! I see you love working in this medium. It was a challenge for me but I must admit that water color paper I was using was of poor quality. I'll have to get some of the heavier weight and try it and maybe I'll like it. 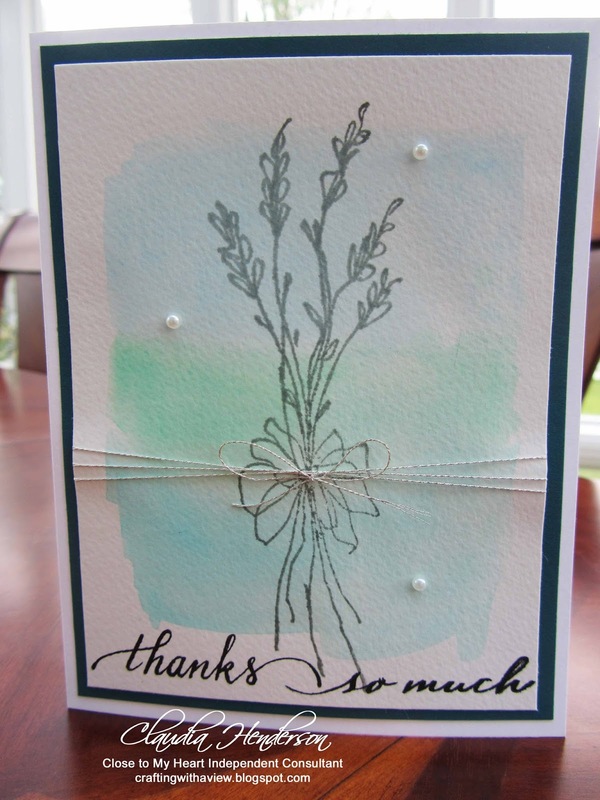 :) Thanks for sharing such pretty cards. Love all these cards! Especially the quilt one - what a great reminder that we don't need to toss things that are not totally perfect, thanks! Beautiful cards Claudia! I really can't pick a favorite! I love your cards and quote at the end! It was great hopping with you again! So very, very pretty, Claudia! I shall "for sure" come back! Great hopping with you! Love the watercolor inspiration! Beautiful cards! You always make it look so easy!! I'll have to try these backgrounds again with your instructions. 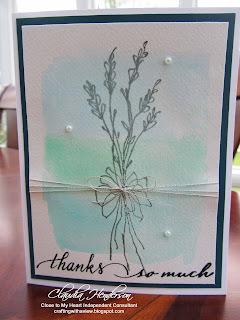 And thanks for using Elizabeth Craft Designs dies! Such pretty water colors! Wonderful cards! Very relaxing! Love you watercolour cards. 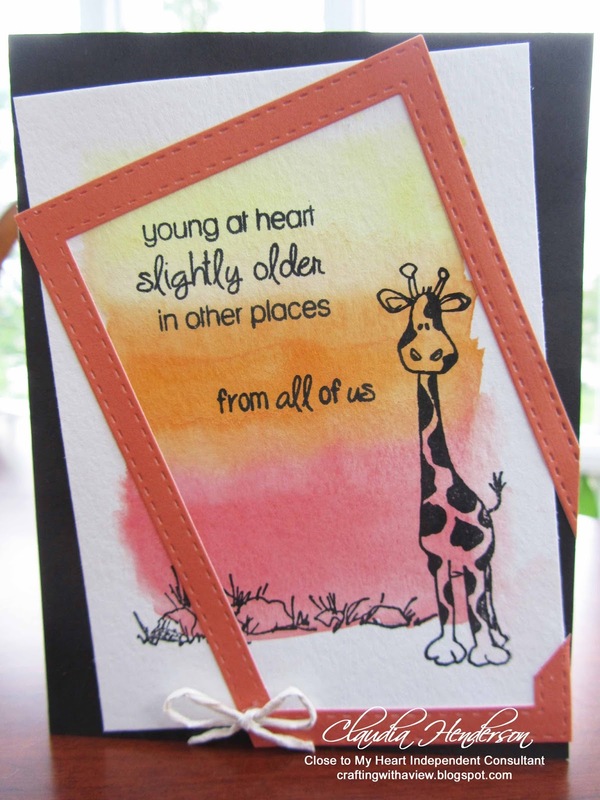 Especially the giraffe as he is just so cute. 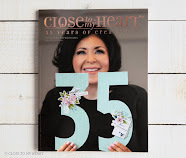 My name is Claudia Henderson and I am a crafter by heart. 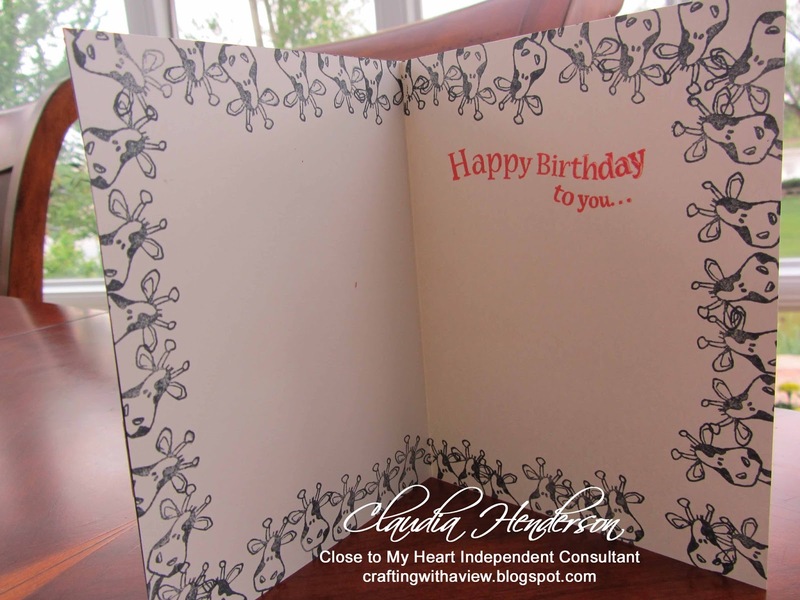 I love to create cards, design pages for photos or any other form of paper crafting. Knowing I can make a difference in someone's day and bring a smile to their face makes me feel good. 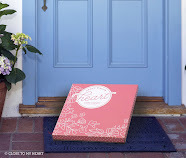 Would you like to save on your shipping costs? 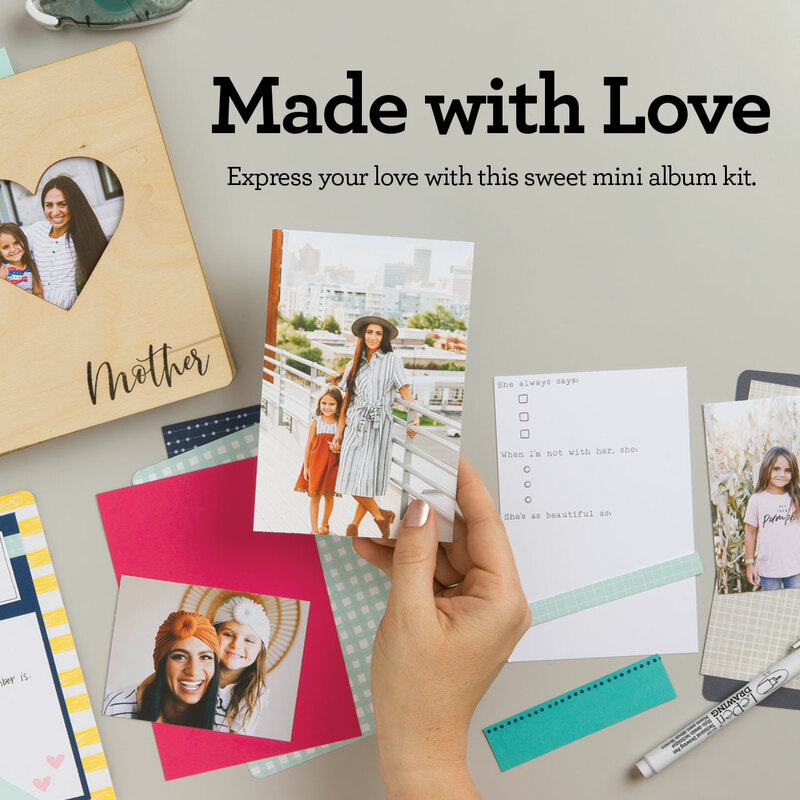 Email me your order and pick it up at my house or check for a meeting in the area! 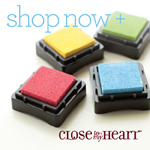 Or you can order online on my website at anytime with shipping directly to you door! "April/ May Collective Order Date"
Down below you'll find all ongoing monthly specials from Close To My Heart in one spot. 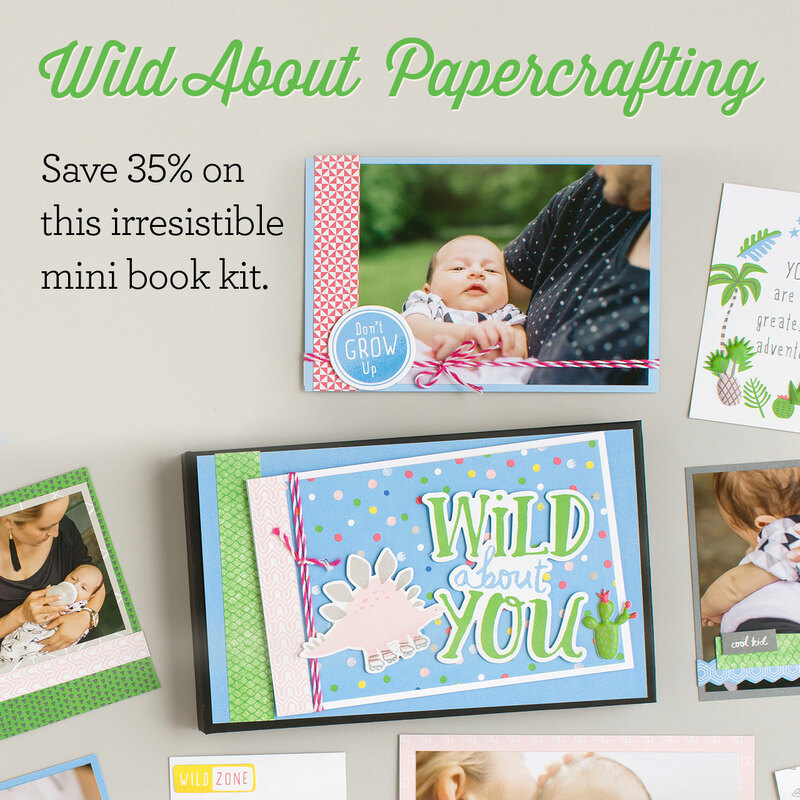 Welcome to Fridays new blog edition, Scrapbooking! Z-Fold Wedding Card "Hello Lovely"
A Year of Card Techniques ~ July Blog Hop ~ In a Bleach of a Moment! 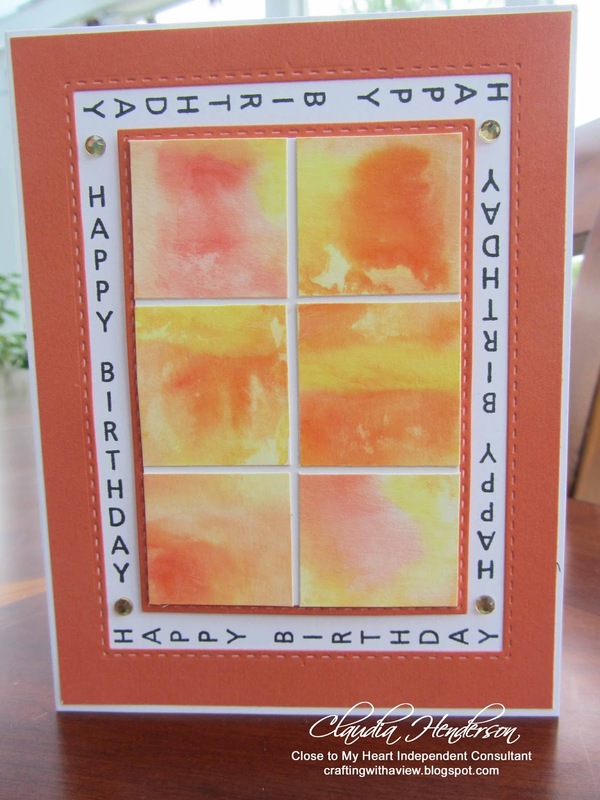 A Year of Card Techniques ~ April Blog Hop ~ Stamp Set Showdown! 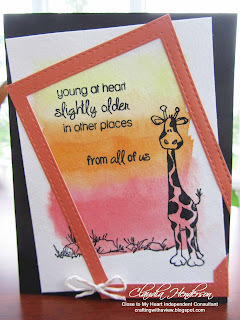 A Year of Card Techniques ~ June Blog Hop ~ Creative Card Folds! I am trying hard to give all you wonderful and creative artists credit for your works and ideas which I might show on my blog. In case I missed you, please contact me so I can give you the credit you deserve. If you like to use my material, please feel free to do so, but make sure you credit me as well. Thank you! Remember to give all these wonderful and creative artists credit for their works and ideas. Awesome Inc. theme. Theme images by richcano. Powered by Blogger.